Michael McFadyen's Scuba Diving - Marley Point The southern side of Sydney is blessed with literally hundreds of dive sites. There are sites all along the Eastern Suburbs from Sydney Harbour to Botany Bay, inside Botany Bay and on the short section of coast from Botany Bay to Port Hacking. These are all excellent, but they are generally located right next to civilisation itself. Port Hacking (Cronulla) is really the southern edge of the city, although there are a few suburbs located a little away from the coast that really make up the accepted southern edge. The world's second oldest national park, Royal National Park, starts here and runs almost all the way to Wollongong, more than 40 kilometres to the south. 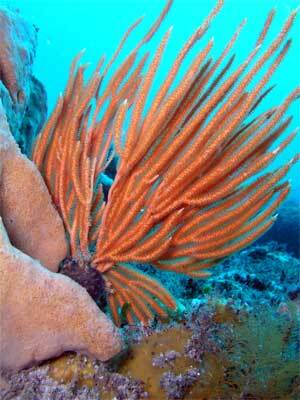 For this reason, the section of coastline south of Port Hacking is probably the best section of coast for diving. It is essentially pristine in nature and does not have any stormwater or rivers draining into it. Accordingly, the water condition is generally better as there is very little dirty water after rain and the fixed marine life is better as there is less silt and mud dropped into the Pacific Ocean and then onto the animals. Probably the furtherest south that most people dive in Sydney (excepting two fantastic shipwrecks) is Marley Point. From Port Hacking, it is a run of five and a half kilometres to Marley Point so it is usually only done in relatively calm conditions. Marley Point sticks out a little bit from the main section of the coast and is an easy spot to find. If you use a GPS, the reading is 34° 07' 02"S 151° 09' 00"E (using AUS66 as datum - see my GPS Page for more info). Once at the location, go around the point and just anchor to the immediate south of the inside of the point as shown in mark at left. You will be very close to the shore. Anchor on the reef just as it comes off the sand. If you anchor at the GPS location, you will be on a sloping rocky reef with good anchor holds. As indicated above, when you dive Marley Point you will nearly always have good conditions as the sea will be calm or even millpond as otherwise you would not be this far down the coast. This is a very good spot in westerly and north-westerly winds although it can be a very rough trip back in a strong north-easter. In southerly winds, you cannot anchor on this spot as you will hang back over the shallows and be in danger of hitting the shore if your anchor gives way even a little. The shallow section of this dive has some fantastic fishlife, with prolific numbers of yellowtail and silver sweep to be seen. You can get right up under the rock platform in about five to eight metres. Once you descend to the bottom, head to the east and follow the edge of the reef near the sand. After about 10 or 15 metres the reef turns south for about 25 to 20 metres. The deeper section of reef near the anchor spot is composed of a lot of boulders, some quite large. Just as you turn to the south you will see a huge boulder. This is an interesting rock, it has some great swim-throughs or caves under it. More about these later. The reef runs down to the sand at about 20 to 22 or so metres. There is no distinct wall but some small sections of low wall. On the sand there are normally some sea dragons. The reef turns again to the east and continues in this direction for a fair way, far longer than you will be able to examine on one dive. As you go you will see that the large boulders on the sand edge form some small gullies in spots as well as small caves and overhangs. After about 40 or 50 metres, I suggest heading up into the shallows a bit. You will see that there are some huge boulders here and you can swim around them (on the northern side) and head back to the west. There is some excellent fishlife here, including ladder-finned pomfrets, yellowtail, one-spot pullers and seapike. As you come back, zig-zag a bit and you will see a lot of great stuff, including small gorgonias, sponges and sea tulips. After you have come back around one of the huge boulders, head south between two of the boulders. The huge boulder on your left reaches up to seven metres or so. You will see an overhang on the right which does not look like it leads anywhere. It does, but see a few sentences later. Towwards the bottom (deeper) part of the boulder you will see another overhang on your right. This is the entrance to the main cave. See the photograph below. This was taken just inside the cave. Go into the overhang and you will see that it is really a large swim-through or cave. Head down to the back left corner. From here you have acouple of options. The first is to exit on your left. The second is to go under and around the rock ahead and exit out the side of the huge boulder. The last option is to turn to your right. This at first does not seem to go anywhere. In fact, if you go under the rock you will come out in a lowish cave that heads back up to the right. This in fact goes right under the huge boulder and comes out at the overhang I mentioned earlier. There are sometimes some wobbegong sharks, including in the swim-through. When you exit the cave from either of the first two exits, you will be located about 20 metres to the north-east of the anchoring spot. A bit shallower from this boulder there is another interesting, if somewhat tighter, swim-through. 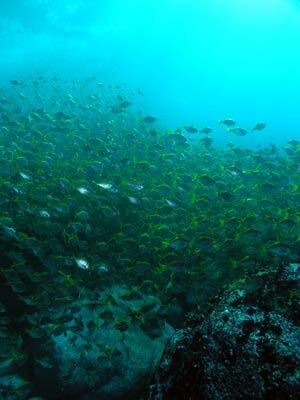 Along the deeper parts of the reef you will see large numbers of wrasse and leatherjackets, especially black reef leatherjackets as well as bream. 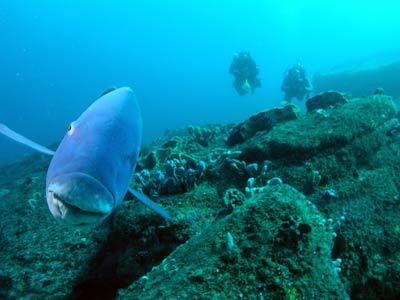 There are also a couple of very large and very friendly blue gropers and also at least one huge ray resident on the sand. Once back near the anchor, head along the reef edge which runs in a north-east to south-west direction. If you head south-west from the anchor location you will gradually get shallower. If you decide to go this way first (say on a later dive or using a scooter), after 10 minutes (20 minutes when swimming) you will be in about 12 metres. If doing this at the end of the dive, head up into the shallows another 7 minutes or so. Once in the shallows, return to the north-east. If the seas are calm enough, go right up till you are just under the rock platform in about 8 metres. There are some great swim-throughs and gullies created between the rock platform and huge rocks that have fallen from the cliff above. 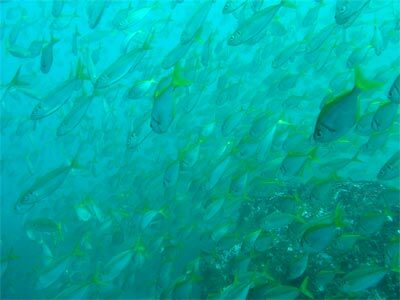 In the very shallow areas (less than seven metres), there is usually prolific fishlife. These fish include seapike, sweep, yellow-finned pomfret, one-spot pullers, luderick, eastern rock blackfish and many other species. As you get back towards the anchor spot, you can swim back deeper (the reef is only 15 metres or so wide near here) and then explore the shallower section. On a dive here in March 1999, just after we exited the water, we had more than a hundred pilot whales pass by our boat. A dozen or more were only metres from the boat and very close to some of our divers who were on the mermaid line. A fantastic experience! In mid-1998 we had two southern right whales swim past us as we finshed our dive. Another great end to a dive! In May 2000 we had 25 metre visibility, great fishlife (including a fiddler ray and an angelshark) and a mother and baby humpback whale cavorting away to the south. In July one of our divers saw a seal on the bottom (we saw it on the surface) and we have had 20 metre visibility or more on the five dives I did here in 2005-6. 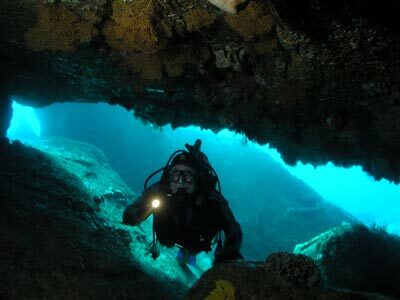 This is an excellent dive location, but you need calm seas to get there and also to be able to anchor close to the shore.